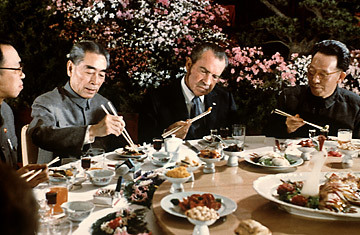 President Richard Nixon dines with Chinese Premier Zhou En-Lai on Nixon's historic 1972 visit. Think back to when a President could dominate the news by simply leaving the country and posing for some photo ops. Maybe he'd even sneak in some history-making diplomatic feats. Exhibit A: Richard Nixon. He's remembered for his 1972 trip to China almost as much as he is for Watergate. And while it's conceivable that relations with the Communist country could have been normalized without a face-to-face meeting between Nixon and Chairman Mao Zedong, news photos of the two leaders shaking hands  not to mention images of Nixon walking the Great Wall and eating with chopsticks  helped convince Americans that Red China was not to be feared. Nixon's China trip was successful, but it's not as if he ended a war. Woodrow Wilson's trips in 1919 to the Paris Peace Conference, however, led to the signing of the Treaty of Versailles at the end of the first World War. During the second, Franklin D. Roosevelt, one of the most widely-traveled U.S. presidents in history, journeyed all over the world to confer with leaders about the conflict. In 1945, near the end of WWII, he attended the Yalta Conference in the Soviet Union with the other Allied leaders, and the end result was the partition of Germany and the creation of the United Nations. Dwight D. Eisenhower, fulfilling a campaign promise, traveled to Korea as President-Elect in December 1952  the Korean War ended seven months later. And, of course, Ronald Reagan helped bring the Cold War to a close when he gave his 1987 speech at the Berlin Wall, challenging Mikhail Gorbachev to "Tear down this wall!" Of course, not all presidential trips abroad are known for altering the course of world politics. John F. Kennedy's 1963 trip to Berlin was notable for the speech expressing support for a free West Germany, but infamous because of the four words he used to drive the point home: "Ich bin ein Berliner," which can be interpreted to literally mean "I am a jelly-filled doughnut." Some reports say the statement wasn't mocked in Berlin at the time, but this hardly matters. In popular memory, Kennedy committed an embarrassing gaffe, something presidents try hard not to do while abroad, where they operate under more scrutiny than usual. Like Clinton, Obama's first trip to a foreign country landed him just over the border in Canada. But this week's sojourn to England, France, Germany, the Czech Republic and Turkey is the President's first real chance to reset America's relationship with the global community. And while there's a chance that Obama's foreign tour might be overshadowed by recession-related news at home  summit meetings aren't as juicy as excessive Wall Street bonuses  he'll at least be further afield than the Panama Canal, the site of the first foreign trip by a sitting U.S. president, Theodore Roosevelt, in 1906.